getting downvoted -4 for something I removed because I thought more about it, stay toxic lads. after thinking about it, this card is pretty descent how it is! battlecry instead of deathrattle plz. True, his body exploded and almost ripped everything in Theramore apart. Aha, thanks for the info. I quit WoW after the TBC, so not familiar with him. lol, no. The goblins dropped a mana bomb in theramore, but he casted a portal to lead everyone to safety and died (since he stayed behind to close the portal). Maybe a 6-mana 7/4 instead? I'm not too sure which one would be more balanced. Wow this and the Warrior Legendary are both insane. Agreed, it could have been more reliable if it was a battlecry effect, but i don't see how this card is worth the 7 mana and the tempo loss when anthonidas and doctor boom exist. They are both 1 mana cheaper with makes this card too weak. This card would have been great and not overpowered being 7 mana AND having the deathrattle effect being a battlecry instead. But the effect is fun, i'll definitly try it if i get it. Everyone keeps yapping on about the synergies with Antonidas, Gazlowe, Thaurissan, and Malygos (synergies I find to be interesting), but has nobody else realized other potential uses? 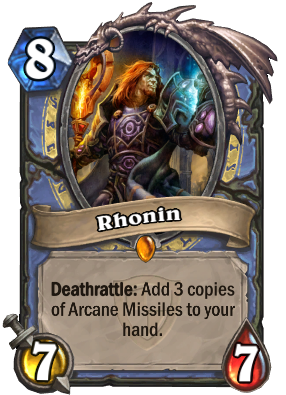 Think about it guys, if unsilenced, Rhonin will increase your overall hand size by three, perhaps allowing for cheaper Mountain Giants and bigger Twilight Drakes. Could we possibly see the rise of a Hand Mage archetype? Was thinking of a giant - freeze mage-ish deck actually. Really interesting idea, but I don't think the deathrattle of a single 8-drop is reliable enough to base your deck on... I'll just combo this guy with Flamewakers, 21 damage on turn 9 (plus 3x whatever spell damage I managed to keep on board) is pretty nice. Hell no, that'd be way too slow. Just accept this is another bad card from the set. Another example of why I personally will not spend any money on this expansion.